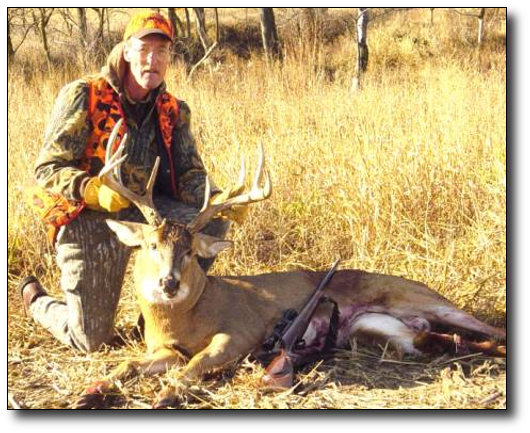 "Good Start for Missouri Deer Season"
Brandon, Member #E181 couldn't have picked a better way to celebrate his birthday. 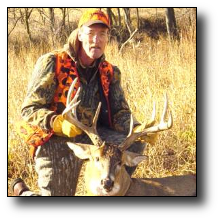 On opening day of the Missouri deer season, he got a present he will remember for years - - a trophy 8 point buck! "My dad (Bill) gave me an over -and - under shotgun (for bird hunting) for my birthday," said Romines, a junior at NW Missouri State University. 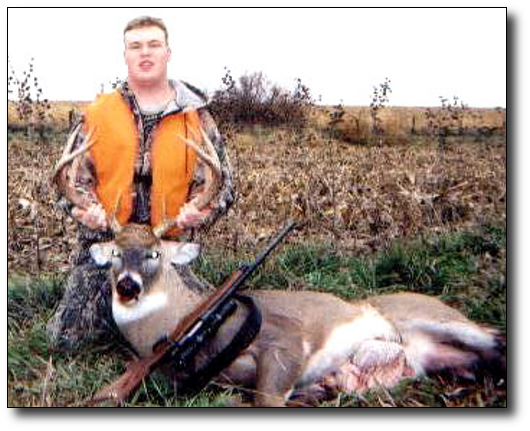 "But getting this big buck is what I'll remember about my 21st birthday." This was the type of opening day that you dream about. Helped by near ideal-weather, cold enough to keep the deer moving, but still warm enough to keep the hunters out. I don't think the hunters could have asked for more. Brandon and his Dad Bill certainly couldn't have. When they showed up at the land they had reserved through the "Hunting Sports Plus Club," they belonged to, their hopes weren't running high. They were disappointed with the looks of the area which they had never seen. There were a lot of open crop fields and not a lot of cover for a deer to hide in. But shortly after the season started, they found that looks were misleading. "When we first got there I was second-guessing reserving that field," Bill said. "It didn't look like that was enough cover to hold deer. There was just a little finger of timber and then a waterway. I put Brandon in a lawn chair in the middle of the picked corn field so he wouldn't have his scent in what cover there was, and I just told him to use his binoculars and glass for deer. Pictures speak louder than words... this property was excellent. Story repeated from the article by Brent Frazee.